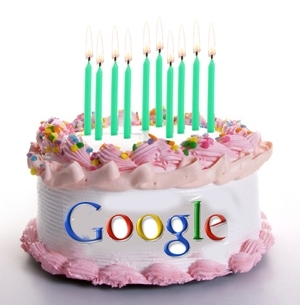 Home / Internet / Many many happy returns of the day Google! Today, 27 September, the search engine Google is welcoming users with a sweet birthday cake. The search major is celebrating its 12th birth day with a cake's picture, on which the 'L' letter in Google is represented by a burning candle. The doodle is a work of Wayne Thiebaud, a famous artist who is associated with the Pop art movement, said media reports. It was reproduced by permission of VAGA, Visual Artists and Galleries Association. The California-based company was first incorporated as a privately held corporation on 27 September 1998. Google has been commemorating special days with its much talked about doodles. The first of such doodle had appeared in August 1998 when the its founders Sergey Brin and Larry Page designed one for the Burning Man Festival. There were doodles to celebrate Halloween, Christmas, Mother's and Father's Day, bar code invention day, birthdays of many well-known figures and so on.